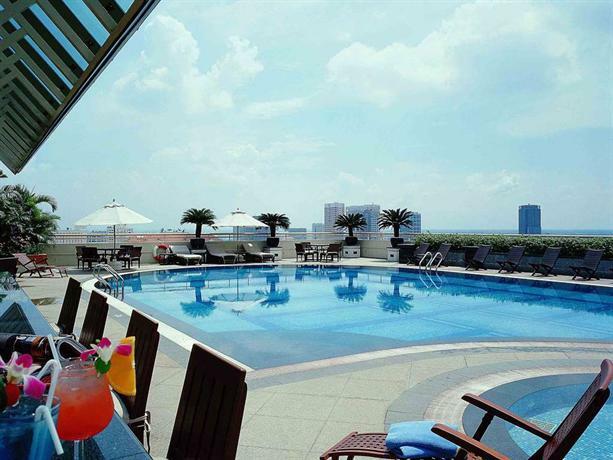 Located on the 18th floor of the 5 star Sofitel Saigon Plaza the unheated rooftop pool offers panoramic skyline views of Ho Chi Minh city and the Bitexco Financial Tower. The outdoor features soft chaise lounge chairs, over-sized sun umbrellas, a stone pool deck, sophisticated lighting in the evening, jacuzzi, sculpted plantings, and a pool side bar. The pool side bar serves a variety of of classic cocktails, wine, beer, as well as a menu of light snacks. The pool side bar is open from 6:30 a.m. - 10:00 p.m. Monday through Sunday and is available for private functions.